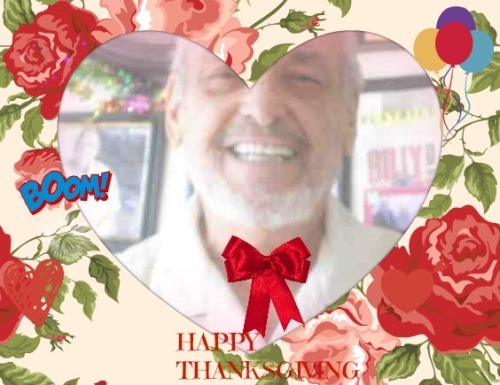 As I approach my 79th birthday I have spent a lot of time this past year thanking people just by thinking of them but as today is Thanksgiving Day I would like to say it aloud. I want to thank everyone who has touched me life in ways both good and bad because it has taken all of you people to make me the happy, contented man I am today. Over the years I have lost touch with many not knowing where they have gone or even if they are still alive but alive or dead I remember them. There are certain people I have met on the Internet from Australia, New Zealand, Holland, Tennessee, North Carolina, New England Spain and England, just to mention a few places, who have come into my life and made it so much better. There are my ‘old’ friends---don’t worry I remember you as you were/looked the day we met--in New York, Tennessee, Texas, Arizona, California and, yes, even here in Florida. Every year death robs me of friends but I see them as guardian angels ready to slap me on the back of my head when I am about to do something wrong and I keep them busy! To all of you who read this THANK YOU for being you, THANK YOU for being there for me, THANK YOU for being in my life and helping me to be thankful for my life. Happy Thanksgiving to you too Brave-Heart and to all the men and women in the military and non-military who are not in the US, we love you and miss you, always thinking of you. Have a Happy Thanksgiving and a safe one.